Special price of BGN 1.00 to combat fog and enticing the commuters to use train instead of private cars. The Sofia Metro (Bulgarian: Софийски метрополитен, translit. Sofiyski metropoliten, also colloquially called Софийско метро, translit. Sofiyskо metro) is the rapid transit network servicing the Bulgarian capital city Sofia. It began operation on 28 January 1998. As of July 2016, the Sofia Metro consists of two interconnected lines, serving 35 stations, with a total route length of 40 km being among the top 30 of the most extensive European metro systems. 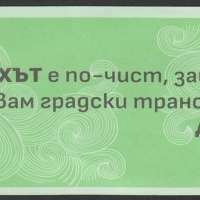 ЗА ПО-ЧИСТ ВЪЗДУХ В СОФИЯ! ВЪЗДУХЪТ Е ПО-ЧИСТ, ЗАЩОТО ИЗПОЛЗВАМ ГРАДСКИ ТРАНСПОРТ ДНЕС!